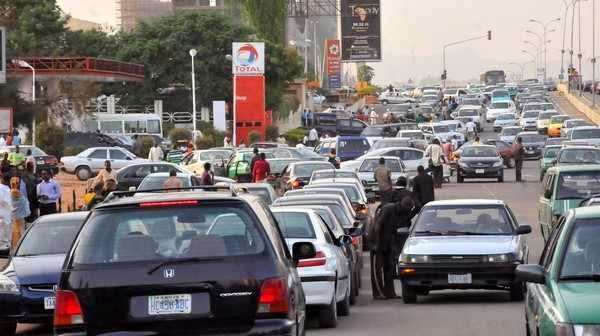 The scarcity of fuel that has hit major cities across Nigeria persists in Ibadan has motorists form long queues at the few filling stations that are selling the scarce product. When IBPulse.com visited some filling stations in various parts of Ibadan metropolis, the palpable tension and altercations suggest that the end may not be in sight anytime soon. At the NNPC filling station along Iwo road – Ojo road, security operatives had to be on standby to ensure peace and order at one of the few stations that still sell the product at the official pump price. The long queue at the station has however affected the free flow of traffic along the major highway, forcing some motorists to drive on the opposing lane. Apart from the NNPC filling stations in various parts of the city, most of the remaining filling stations visited by IBPulse.com are selling the product at prices that are as high N120. Some have also introduced other forms of charges such as N200 additional fee on every 10 liters of fuel purchased. The high cost has had impact on the cost of transportation and other fuel-dependent activities. Commercial drivers and motorcyclists said the hike in price is inevitable. “We spend more to buy fuel now. Even before you can get it, you will have to go through so much stress at the filling station. One policeman slapped me today at the filling station. Those are the kinds of things that the hike has brought,” a motorcyclist told IBPulse.com. While appealing to the Nigerian government to address the problem as soon as possible, he appealed to commuters to understand the reason behind the hike in prices. “We are not happy that fuel is scarce, we are also not happy that the price has to go up but it is not our making, it is due to the situation of things. I appeal to Ibadan residents to kindly bear with us,” he said. However, the cost of transportation on the state government’s Ajumose Transport Service is not affected by the hike in pump price as the highest price remains fixed at N50.